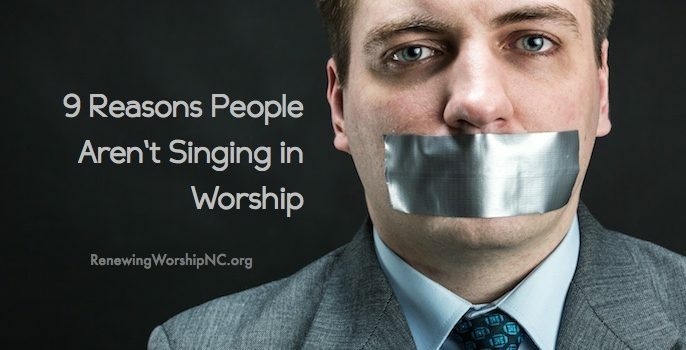 Worship leaders around the world are sadly changing their church’s worship (often unintentionally) into a spectator event, and people are not singing any more. Before discussing our present situation, let’s look back into history. Prior to the Reformation, worship was largely done for the people. The music was performed by professional musicians and sung in an unfamiliar language (Latin). The Reformation gave worship back to the people, including congregational singing which employed simple, attainable tunes with solid, scriptural lyrics in the language of the people. Worship once again became participatory. The evolution of the printed hymnal brought with it an explosion of congregational singing and the church’s love for singing increased. At first, this advance in technology led to more powerful congregational singing, but soon, a shift in worship leadership began to move the congregation back to pre-Reformation pew potatoes (spectators). What has occurred could be summed up as the re-professionalization of church music and the loss of a key goal of worship leading – enabling the people to sing their praises to God. Simply put, we are breeding a culture of spectators in our churches, changing what should be a participative worship environment to a concert event. Worship is moving to its pre-Reformation mess. 2.We are singing songs not suitable for congregational singing. There are lots of great, new worship songs today, but in the vast pool of new songs, many are not suitable for congregational singing by virtue of their rhythms (too difficult for the average singer) or too wide of a range (consider the average singer—not the vocal superstar on stage). 3.We are singing in keys too high for the average singer. The people we are leading in worship generally have a limited range and do not have a high range. When we pitch songs in keys that are too high, the congregation will stop singing, tire out, and eventually quit, becoming spectators. Remember that our responsibility is to enable the congregation to sing their praises, not to showcase our great platform voices by pitching songs in our power ranges. The basic range of the average singer is an octave and a fourth from A to D (more). 4.The congregation can’t hear people around them singing. If our music is too loud for people to hear each other singing, it is too loud. Conversely, if the music is too quiet, generally, the congregation will fail to sing out with power. Find the right balance—strong, but not over-bearing. 5.We have created worship services which are spectator events, building a performance environment. I am a strong advocate of setting a great environment for worship including lighting, visuals, inclusion of the arts, and much more. However when our environments take things to a level that calls undue attention to those on stage or distracts from our worship of God, we have gone too far. Excellence – yes. Highly professional performance – no. 8.Worship leaders ad lib too much. Keep the melody clear and strong. The congregation is made up of sheep with limited ranges and limited musical ability. When we stray from the melody to ad lib, the sheep try to follow us and end up frustrated and quit singing. Some ad lib is nice and can enhance worship, but don’t let it lead your sheep astray. Once worship leaders regain the vision of enabling the congregation to be participants in the journey of corporate worship, I believe we can return worship to the people once again.